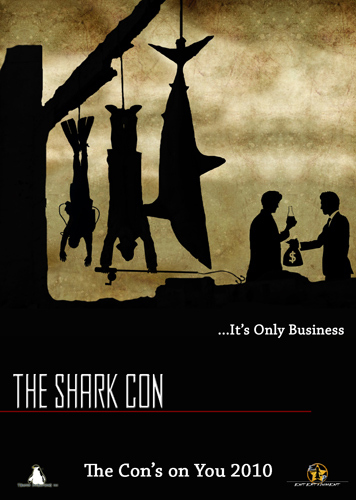 The Shark Con is a controversial new documentary from Film Maker Rusty Armstrong and Shark Diver Magazine Editor Eli Martinez. The film focuses on the vastly differing opinions of shark fishermen, shark researchers and shark conservation groups. After the release of an intentionally provocative first trailer, the film came under immediate attack from conservationists and a number of shark dive operators. Eli, who was already a controversial figure because of his practice of hand feeding large tiger sharks, was slammed as an enemy of sharks. The criticism rose to the point where a FaceBook hate group was temporarily created and someone made a farcical version of the trailer. In 2006 Rusty was hired to film Summer of the Sharks a light hearted look at the world of two shark divers as they traveled around North America filming sharks. After participating in many conversations with avid shark divers, conservationists, researchers and fishermen, Rusty noticed that each group had their own view about the state of shark populations. The shark con consists of a series of interviews in which prominent figures from each faction have a chance to voice their opinions. The fishermen are collectively represented by a colorful character named Captain Bill who is obviously unhinged. He repeatedly refers to his own 'research' in which he has ascertained that sharks are not endangered at all. He then launches into a series of bloodthirsty tales about dispatching sharks. One interviewee points out that conservationist's rely on the plight of sharks to get funding. While this is not in itself a misappropriation of funds because most conservation groups perform vital work to protect sharks, it inadvertently raises the question of whether shark conservation groups are self serving. The Shark Con is interesting but confusing. The fishermen lead by Captain Bill quickly dig their own graves but the movie raises doubt regarding the number of sharks being killed each year without clearly spelling out that regardless of the number killed, sharks are in big trouble. That's just my opinion after seeing the rough cut so the final movie may be a little different. I have a short interview about shark photography during the documentary and I'm good friends with Eli so its impossible for me to be completely objective but I believe that The Shark Con is not damaging in itself and is more or less pro-shark. However, the spin that comes across in the trailer may ultimately be more detrimental to the cause of shark conservation than the actual film. Watch it before you condemn it and then decide for yourself.